I’ll admit: I didn’t really “get” this book. I had seen a TED-Ed YouTube video that told me how great it was, and I decided to give it a try. While there were parts that were entertaining, most of this book went over my head. I suppose if I understood Columbian history and the culture of Central and South America, I might have had a better grasp of what was going on. As it was, I felt lost most of the time and kind of wonder what makes it so highly-recommended. Perhaps my biggest qualm with this book is how its narrative structure is laid out. There’s practically no dialogue, and it’s basically told in the form of a parable or fairy tale. There are a lot of characters, but their names were so similar that I had trouble keeping track of them all. I get they’re all part of the same family, but having to remember so many individuals and the familial connections to each other was a struggle. I also felt a little lost because there wasn’t a strong narrative thread tying everything together other than the fact that it all took place in the same small town. This is not to say One Hundred Years of Solitude has no merit, though. Some of the elements of “magical realism” were interesting and could have been the solid base of their own stories instead of being jammed together in this book. The pacing of this book was also pretty peppy, as it didn’t seem to linger too long with one character, realizing that it had many generations to cover. Even though it’s considered a classic (much like Ulysses), I’m not sure if I agree, and I am certainly welcome to my opinion as you are welcome to yours. 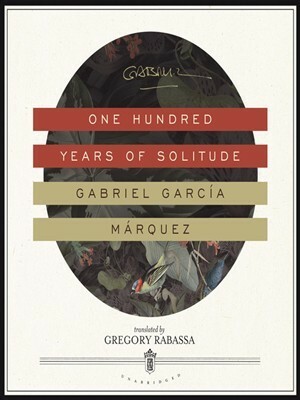 A much better book for those who are “in the know,” I give One Hundred Years of Solitude 3.0 stars out of 5.